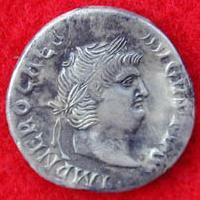 Forgeries of ancient Roman and Greek coins offered for sale on a large scale on the internet! This page is dedicated to educate and warn people about counterfeit ancient coins offered through the internet, and to acquaint them with the appearance of these coins in order to distinguish them from the genuine ancient coins.
" Online Liquidators / Toronto Group " - cast forgeries in large numbers! BEWARE: Many images (high speed connection recommended)! "antiqueseller_13 " - the Vancouver branch? from an otherwise honest dealer? Two examples were offered on the internet in May, 2003. One on eBay and another in a Yahoo auction! More ancient fakes of Lebanese origin. who -like the Toronto group- also have a tendency of chancing identities! Barry & Darling Ancient Coins - Fake or Real?